Foreign Language CSR Report Service | Omega Communications, Inc.
Business today operates on a global scale, and it’s becoming increasingly important for Japanese companies to communicate their CSR activities in other languages. More companies now are issuing combined CSR and IR reports that provide important information for overseas investors wishing to learn more about those companies. CSR reports translated from Japanese into other languages play an important role, but they may not necessarily be comfortable for foreign readers to read. That is often because the original Japanese reports are simply translated into other languages without taking non-Japanese readers’ needs into consideration. For example, Japanese and English have very different grammatical structures: since Japanese sentences often lack subjects, the English text can sometimes be vague and difficult to understand. Before commissioning a translation, our staff thoroughly reviews the Japanese text and rewrites it if necessary. This helps produce logical and natural-sounding translations which are easy for foreign readers to absorb. 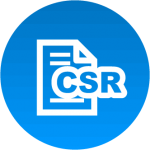 Translators commissioned to work on CSR reports are experts in the field who have mastered the terminology and conventions of report-writing of this kind.